When I’m looking for a restaurant in New York City that most closely resembles those found in Las Vegas, I always head straight for Rosa Mexicana. After some delicious guacamole and fish tacos it was time to order the dessert our waiter recommended. “Everyone loves the cupcake” he said. So we ordered the “Pingüino Hazelnut Chocolate Cupcake” with homemade Mexican chocolate. It’s filled with hazelnut mousse and topped with créme fraiche whipped cream and also comes with an espresso-piloncillo-chocolate sauce. 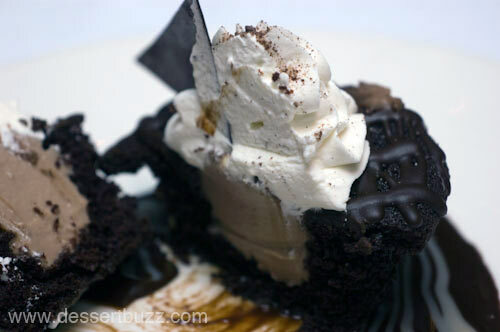 If you enjoy cupcakes like the kind they bake at Crumbs (the really big ones) you will like this dessert. The hazelnut filling has a pretty authentic flavor and the quality of the chocolate in the pool below the cupcake is also nice. My only complaint is that the cupcake was served ice cold rather than room temperature. They must have brought it straight from the refrigerator. Rosa Mexicana is located at 9 East 18th Street. Their website is here. 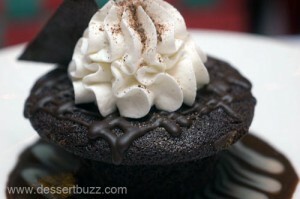 This Hazelnut Chocolate cupcake looks so yummy! Annie, yes as I said it wasn’t bad at all – definitely worth splitting one if you’re with a group.